Hunger Games-themed ride open at Motiongate! The Panem Aerial Tour, a 4D Motion Simulator, and the Capitol Bullet Train, a shuttle/full-circuit launch coaster, are now open! All themed to the wildly popular Hunger Games book and movie series! After touching down, you will be able to enjoy a high-energy street show filled with percussion from District 12’s coal miners, who take up their tools for more creative (and less backbreaking) work in an interactive musical extravaganza. You can also take a turn around the shopping outlet and treat yourself to some exclusive Hunger Games merchandise, or refuel at Peeta’s bakery, with a choice of over 20 themed food and beverage options. 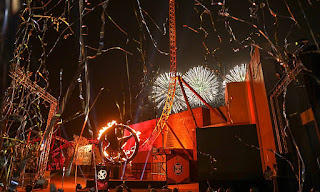 At the official inauguration on Friday October 20, Mohamed Almulla, Chief Executive Officer of DXB Entertainments PJSC, the company that owns Dubai Parks And Resorts said, “Dubai has always been home to some of the biggest and most prominent events and shows in the world. Today, we are proud to launch the latest addition to Dubai Parks And Resorts, a first of its kind in the world. A weird theme but one that is sure to attract many guests as the popularity of Hunger Games seems to still be in place. I must say it's always exciting to see the actual actors from movies doing theme park attractions. Will the appeal last or is this just as horrible an idea as it sounds?